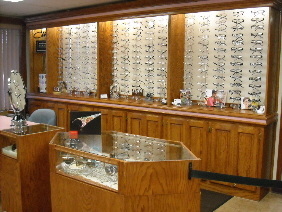 Our optical carries thousands of designer frames to meet your needs. Are you tired of squinting in the sunlight? Prescription sunglasses offer complete UV protection from the sun's harmful rays. Make your vision much more comfortable with sunglasses. Choose from a large selection of prescription and non-prescription sunglasses from Christian Dior, Rayban, Oakley, Costa, Nike, Coach, Tory Burch and much more. Would you like a pair of glasses for computer or reading use? Computer or reading glasses offer a wide range of vision for all of your up close needs. Do your glasses always complete your outfit? We offer a complete selection of metal, plastic and rimless glasses to make your style picture perfect. Just as we have multiple pairs of shoes for various occasions, why not have a selection of glasses to meet your fashion needs? We offer prescription recreational glasses designed for your athlete's needs. All of our sports goggles come with a comfort band designed to keep them snug and secured for optimal vision and safety. Do you need safety glasses for working outdoors? We are one of the few local opticals to offer ANSI certified safety glasses. Don't just pick out your safety glasses from a catalog. We have several frame options in stock to choose from, including Wiley-X.